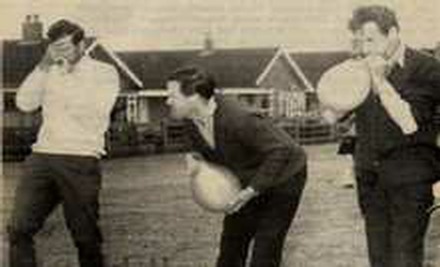 The Woodborough Community Association was formed in 1965 to provide the recreational facilities, which were proving necessary for a rapidly expanding village. 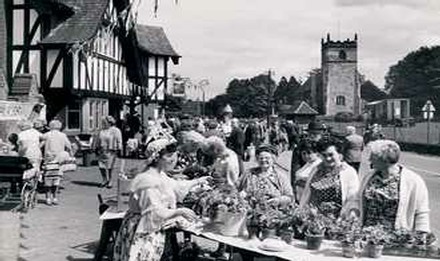 The population of Woodborough had remained fairly constant for a century but the population was significantly increased in the 1960's with three small housing developments, followed by two larger estates being built in the 1970's adding about 260 homes to the village. This growth affected the nature of the village population emphasizing the need for a new school and village hall. 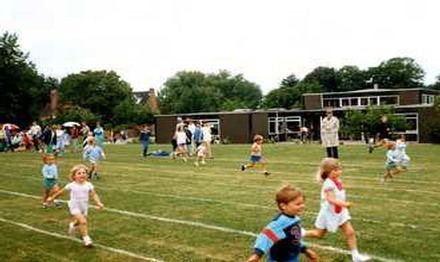 Feast Sports events - Top left: 1971 - Top right: 1975. 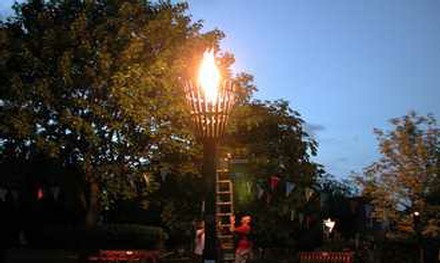 The Queen's Golden Jubilee was celebrated on 3rd June 2002 at 10.00pm with the lighting of our beacon. 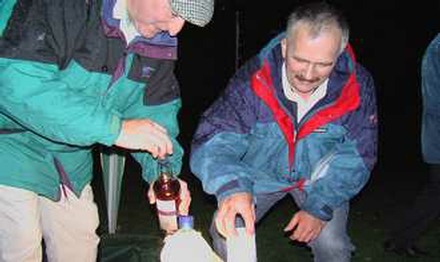 This was part of a nation-wide lighting of beacons with over 1000 beacons in the UK and nearly 2000 world-wide, local people came together on Governors' Field to celebrate this event. 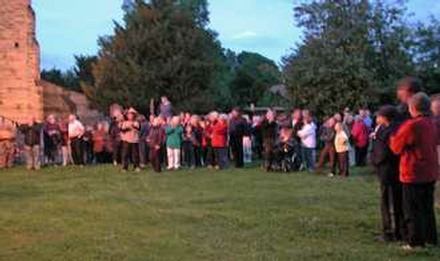 Some images of Woodborough during this special celebration. 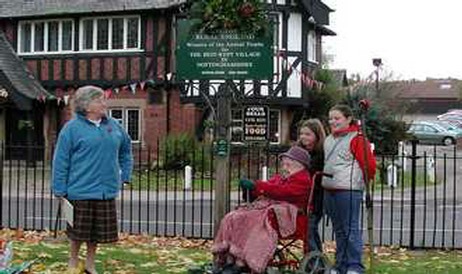 In 2005 the Village entered and won "The Best Kept Village" competition for villages with up to 2000 residents. We now go through to a larger competition against other category winners from the whole of Nottinghamshire. 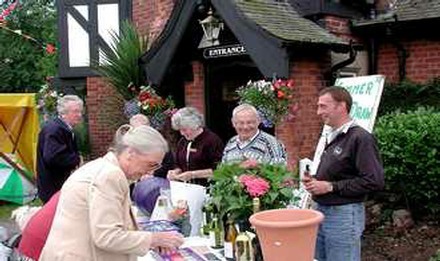 We also entered the "Village in Bloom” competition and we hope to announce both results in mid September. Details of our entry in "Village in Bloom" with accompanying photographs will appear elsewhere on this website in the autumn. The 200th anniversary of the Battle of Trafalgar was also a cause for celebration. May the great god, whom I worship, grant me my country and the benefit of Europe in general a great and glorious victory; and may no misconduct, in anyone tarnish it; and may humanity after victory be a predominant feature in the British fleet. For myself individually, I commit my life to him who made me and may his blessing light upon my endeavours for serving my country faithfully. To him I resign myself and the just cause which is entrusted to me to defend. 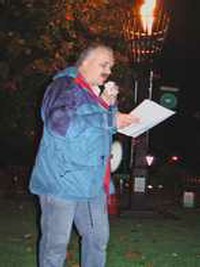 The Chairman of the Community Association, Richard Pietkiewicz. The Chairman went on to give a brief résumé: The battle of Trafalgar can be considered the most decisive naval battle, both tactically and strategically, in history. It not only eliminated Napoleon's plans to invade England, but had also destroyed French and Spanish naval power and ensured the dominance of the British navy throughout the world. Nelson's embalmer, Mary Buick, an unsung hero of Trafalgar, placed him in a battle brandy. The fact that she was a woman meant her name was not recorded on any official crew roll. It comes as a surprise to many also that children played their part too. The youngest was an eleven year-old cabin boy from Leith in Scotland; actually 30% of seamen taking part in the battle were from Scotland. 18,000 officers and sailors fought under Nelson and of those 20 men were listed on the ships books as being born in Nottinghamshire. When Nelson's body was taken out of the brandy barrel members of the crew drank the remaining spirit calling it Nelson's blood. They must have been still high as kites as at Nelson's funeral the crew leapt forward as his coffin was placed in the grave and ripped up HMS Victory’s flag for keep sakes. 27 British war ships took part in the battle. To mark this the Nottinghamshire Wildlife Trust who look after Ploughman Wood, will be planting 27 new woods, each named after one of his ships. Captain Thomas Oldacres Hewes was a captain during the time of the battle of Trafalgar. His father was the curate and schoolmaster at Woodborough. It is thought by some that he fought at Trafalgar, but unfortunately research cannot prove this. If he did, then he was lucky and lived to be the oldest captain in the Royal Navy, dying in 1872 aged 90. He is buried in our churchyard on the right just inside the Lingwood Lane entrance. Battle of Trafalgar by Richard Pietkiewicz. It was also agreed that the existing organizations in the village be invited to nominate one member each to serve on this committee. 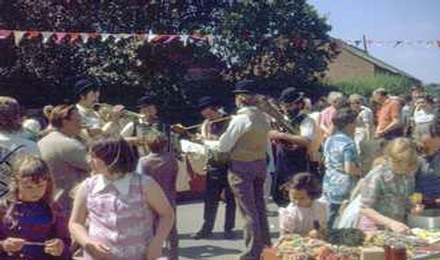 The terms of reference of the Community Association were to promote and support all aspects of community life in the village. 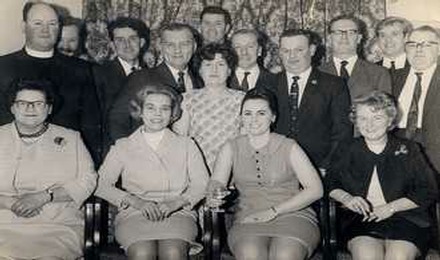 It was thought that everyone living in Woodborough should be a member without payment of a subscription, although voluntary subscriptions would be welcomed. 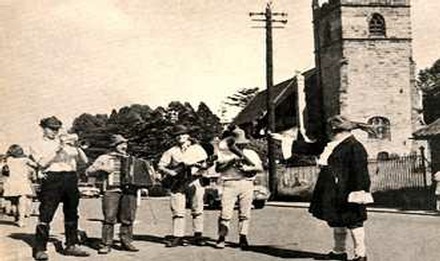 The Association generated a lot of interest in the village through its fund raising activities, with different events being offered every month. A priority was to raise money for a new school to cater for the population growth, and pressing for a new Village Hall to provide more adequate facilities for meetings and social events. 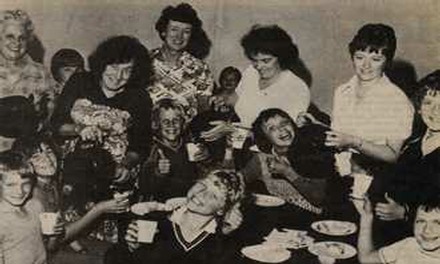 The Association also helped to finance other new groups such as Mother & Toddlers, to cater for specific needs. In some cases it also gave encouragement and financial backing to individuals, particularly to young people taking part in scouting and similar events where they needed help in obtaining sponsorship. For example donations were given to Scouts and Guides going to Jamborees, a girl selected to join the Tall Ships Race and a boy shooting the rapids on the Colorado River. The Association also sponsored Michael Thornewill to participate in Operation Raleigh [now Raleigh International. Ed] in 1986 and this may have stimulated his later interest in trekking to the North and South Poles. Above scenes from various Street Markets. 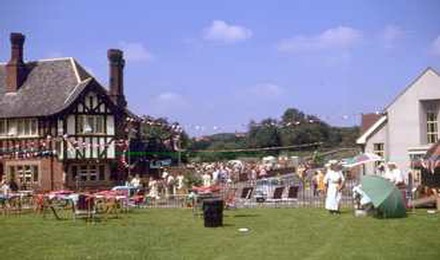 The new Village Hall was eventually started in 1973, although Committee meetings continued to be held in the Four Bells. 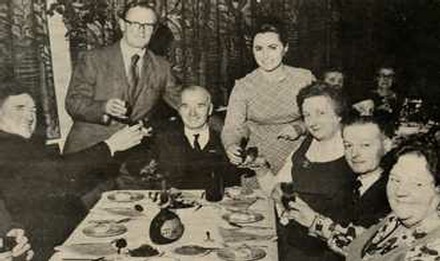 The first Community Association fund raising event was a Wine & Cheese party in July 1965 at Punch Bowl House, courtesy of Mrs Cooper. 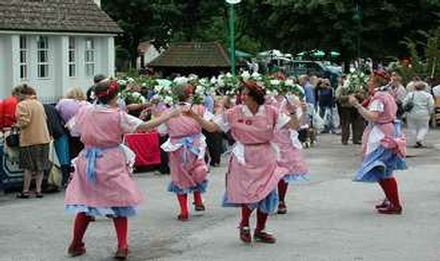 Many other events were held over the next three years, some of those held then have become village traditions; others have fallen by the wayside. 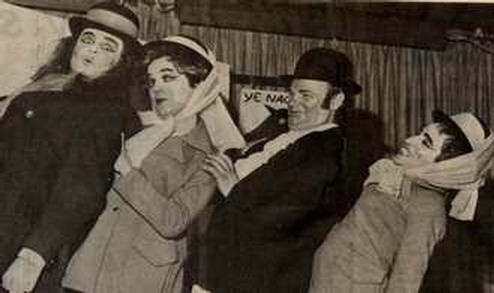 performing in the 1978 pantomime - Cinderella. The busiest years were between 1977 and 1983, after this support began to wane and events were reduced to about six per year. 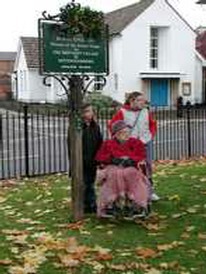 However, in 1999 a Millennium Beacon was designed and erected in Governors' Field to mark the Millennium and incorporated a special Woodborough Community Association logo depicting hands in friendship. 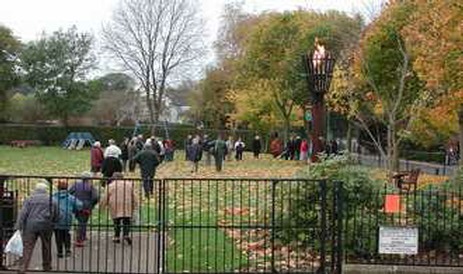 Lit for the first time on New Year's Eve 1999, it can now be used by anyone in the village to mark special occasions and in 2001 it was lit to commemorated two 100-year birthdays - the Queen Mother's and a local resident, Nina Litchfield. 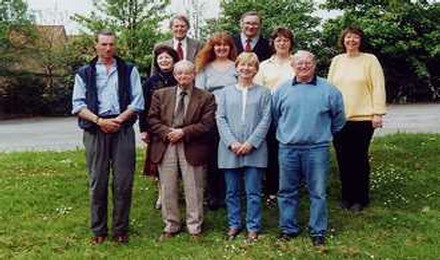 In 2001, encouraged by the efforts by members of the Community Association, Woodborough became the "Best Kept Village" for the whole of Nottinghamshire. 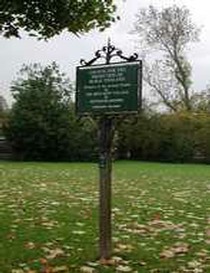 On 8th November 2001 a post and plaque was placed and unveiled in Governors' Field and proudly stayed for the coming year. Below a selection of photographs taken on Saturday the 10th November 2001, the day the award was presented to the village.